Shoujo Shuumatsu Ryokou emerges from its in medias res cocoon as a contrasting hybrid, a chimera formed with the body of a post-apocalyptic lion, the slice-of-life wings of an eagle, and the dramatic-laced tail of a snake. This mystical entity is normally Greek in origin and fantastical in nature, but this variation hails from the land of anime – and “exists” at that too. From the onset, an amalgamation of parts so jumbled is rightfully questionable. A dreary sadness plagues the atmosphere as melancholy and loss envelop the area, but cuter interactions between the two leads and their environment spark a warmth and a comfort through giggles and fun more commonly found among the cheery, comedic genre. Despite these extremes, the show balances the creature through thoughtful coexistence. The taming evolves from the manner in which Shoujo Shuumatsu Ryokou partitions itself into small chapters. These chapters focus on a certain item, place, concept, or action, keeping the scope of their current situation narrow despite the vastness of their predicament. As such, there’s no real plot to speak of, and there doesn’t need to be one in the first place. 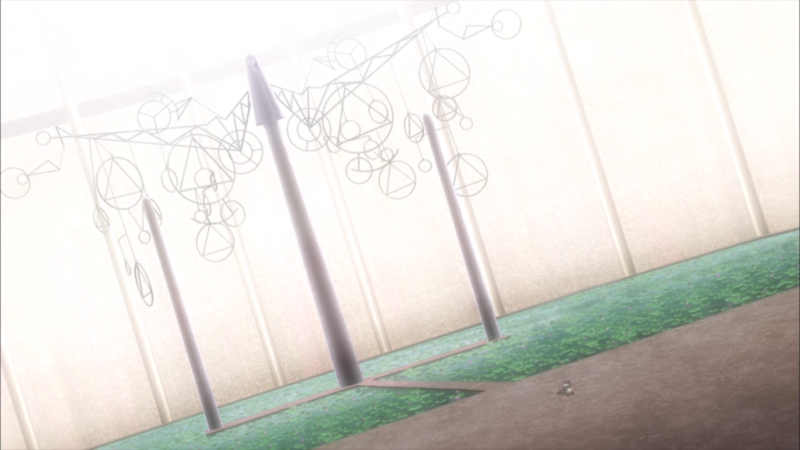 Instead, it spends its time essentially curating a bunch of vignettes as if they were a museum on the back of this chimera, showcasing the testaments to humanity and lining them up for the audience to see in continuous fashion as Chito and Yuuri roll along on their tiny military vehicle. This lofty museum features that thoughtfulness. For example, the two ladies will investigate an unknown place and hum and sing a song as they make rations. Or they may sit down in an empty room, imagining the comforting bliss a nostalgic home provides. Or maybe they dance the night away while under the bright moon and a drunken stupor. Whatever the case, these smaller, almost inconsequential asides demonstrate a caring nature and a maturity in the writing as its methodical approach typifies the happiness discovered in those everyday happenings. Moments in life about life – without life around them. A contrast so distinct it amplifies the meaning and the power behind its life-lesson topics and appreciation towards the simple things nearby. The outside of the museum displays the bigger pictures. Graffiti takes shape as Shoujo Shuumatsu Ryokou challenges ideas such as religion, war, and death, darker subjects which remind the audience that humanity has its underbelly and its quirks too. Simultaneously, clear windows introduce compassion and determination, for humanity contains goodness at its core. A chimera and a museum cannot stop all woes, though. 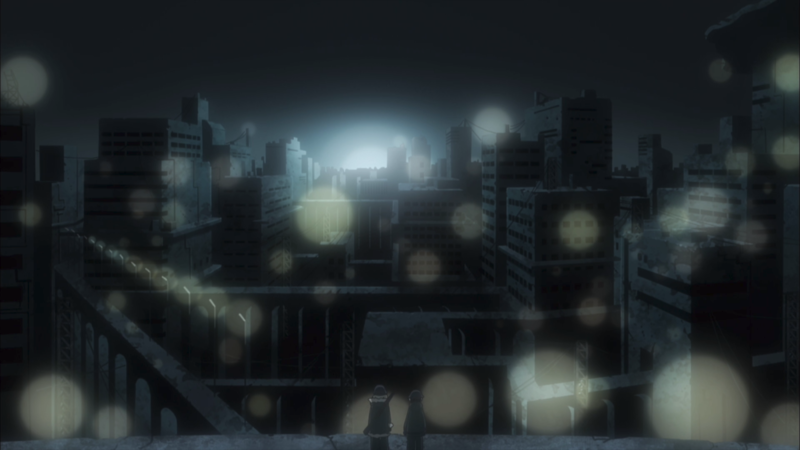 It’s arguable that the anime doesn’t lean far enough into its apocalyptic setting. Not that their trip is idyllic or exactly easygoing, but the show keeps itself within a specific circle as it ignores potential avenues (e.g., injuries, psychology). It also bends its fictional realism a tad too far during the last couple episodes when a bizarre technological super-beings subplot treads more so into fantastical territory. Yet (and to extend this extended metaphor one last time) the beast and the building defend themselves. 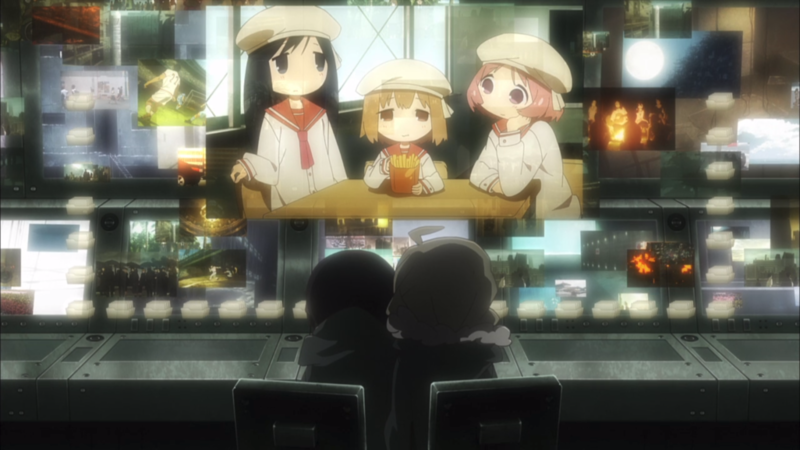 Various dialogue pieces highlight how Chito and Yuuri will reference previous episodes, forming a nice sense of continuity from all their past experiences. And it balances the tone between the drama and comedy well, refusing to lose sight of either as an indication of its sturdy narrative. Indeed, the overall story is strong in execution. 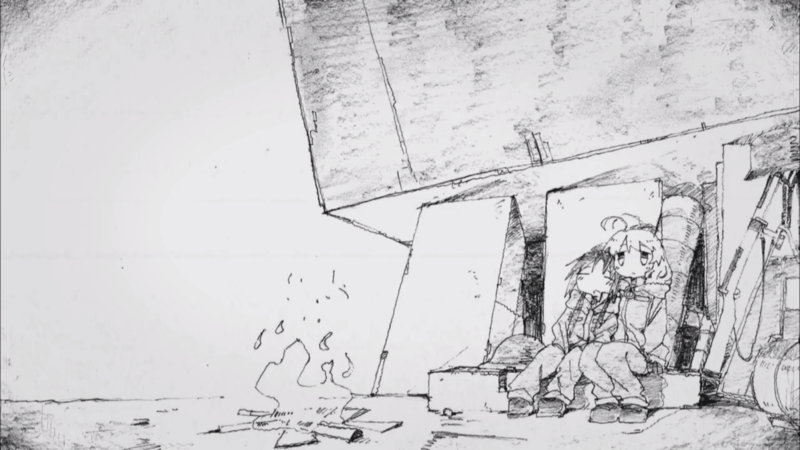 It’s weird to call destruction of this magnitude “majestic”, but Shoujo Shuumatsu Ryokou delivers a majestic artistic vision through the squalor and the voids it depicts. All-important establishing shots immediately get at the decrepit state of the world, capturing the wreckage as an unfortunate woe that the girls must traverse to survive. Delipidated buildings. Barren fields of war. Metallic warehouses and hangars. Wind farms. Concrete pillars and hallways. Factories. Abandoned structures. 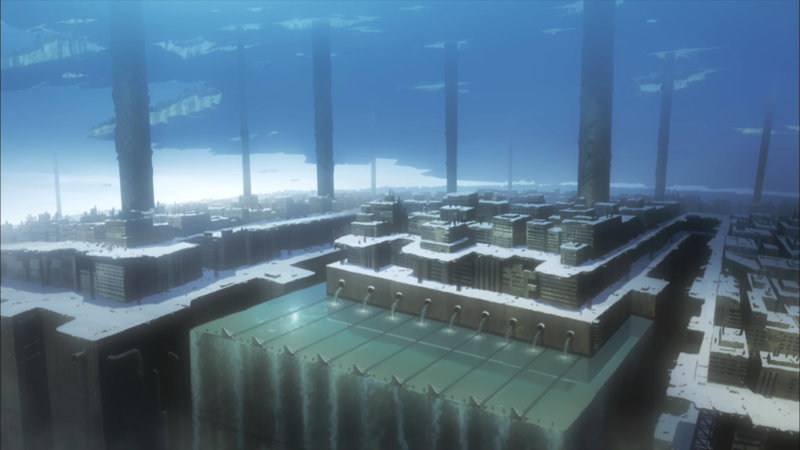 As the title of the anime hints at, this tour of these lasting monuments enshrines not only the pessimism of the situation but also the history of what once was. This terrain formed from the rubble of a civilization long dormant thus immortalizes the despair and the malevolence of a place whose eerie loneliness the audience both sees and feels. To this end, the show incorporates swathing details for better realism and quite the dreary color scheme with heavy emphasis on those darker hues. Weapons, tangled masses, and large broken objects litter the path almost everywhere, oppressing with stark impossibility. And the colors: greys, blacks, browns, greens. They complement the carnage present, and they drag down the mood not by force but by a constant realization that there’s almost nothing left except sadness. Yet, through this wreckage, a serene beauty surfaces. 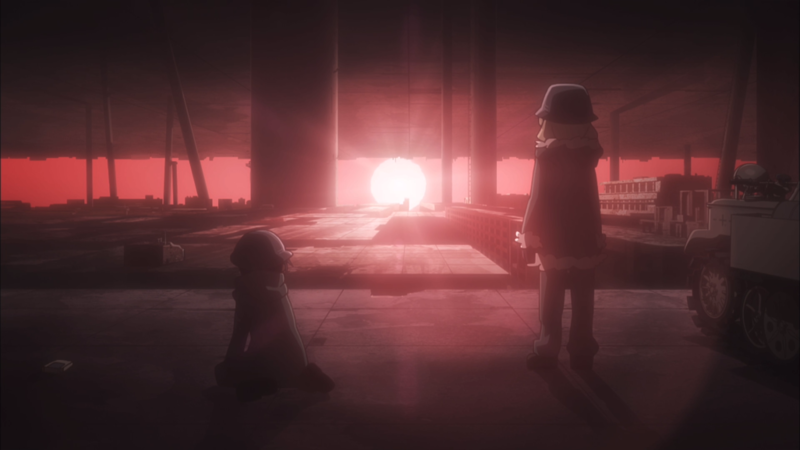 Shoujo Shuumatsu Ryokou punctuates its somber air with scenes of clarity, contrasting the darkness with light and with awe, rays of hope which the audience and the girls admire. From a high-rise look-see at the dazzling cityscape beneath them to a full view of a bright room reflecting off the glass “pond” as a tribute to some unknown deity. The anime lets its majesty shine among the snowy hills, the makeshift forests, and the underground caverns for rare glimpses of optimism. 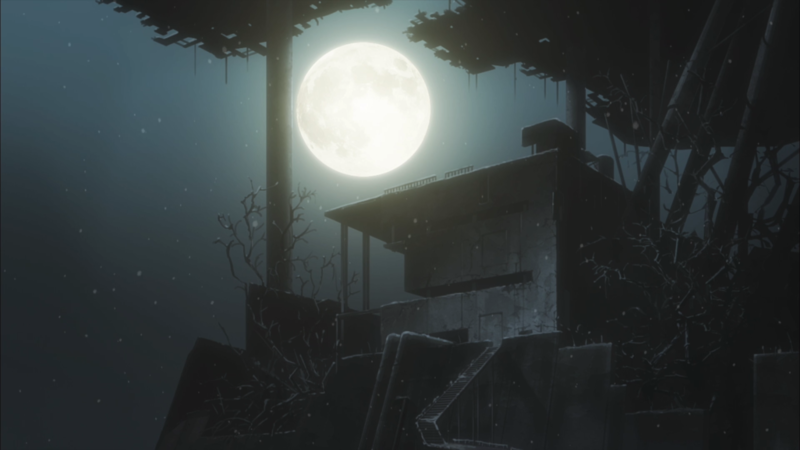 Beyond the gorgeous setting, the anime makes other conscious decisions with its visuals. Movement remains solid throughout as they interact with the environment and move onwards to that next destination, relying on its at-best stiff CG models only for those most taxing maneuvers with their vehicle. It also goes for creativity as well. A grainy photograph of the two or the smudged filter of an old-timey hand telescope showcase the show branching out with newfound minutiae and perspectives. To top it all off, Chito and Yuuri have nice designs to match. They fit the part, what with their soldier helmets and heavy coats protecting them from the inescapable harshness. Contrasting traits – heights, eyes, hairdos – pinpoint their differences by looks alone and setup their duo duality with ease. Not to mention how their round-yet-blocky features afford a lot of malleability, seen in the slightly squashed style that aids the comedy with exaggerated looks and extra silliness for a cute, fun approach as required. The setting. The fundamentals. The designs. Each part strikes gold in each artistic part, and the anime is all the richer for it. 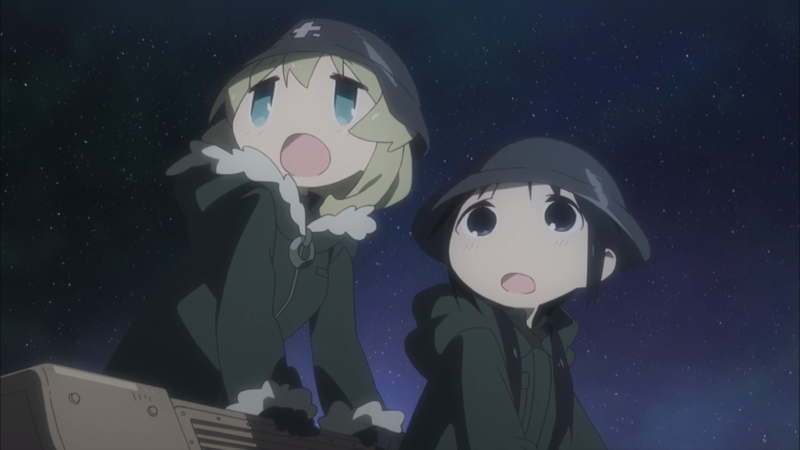 Chito and Yuuri enter Shoujo Shuumatsu Ryokou as a tried-and-true narrative pair: the brains and the brawn. Such a standard setup has been around for ages because it works, and these ladies are yet another testament to this fact. Chito essentially leads the group (if it can be described as such). She pilots their mini-tank from location to location, and she manages their free time and side ventures with a perceived caution. Moreover, true to her brainy nature, she reads books to understand culture, she writes down notes as a record of their adventure, and she has her wits about her. However, she has her faults. Heights scare her completely. She does not know how to swim. She lacks physical strength. Yuuri earns opposite stripes. While she loves to laze about and can never have enough food in her belly, she certainly can be her own individual. Using weapons, pushing debris, not being afraid of heights. Clearly the brawny muscle, she anchors the trip they take with a stout head on her shoulders. Much like her companion, though, faults arise. The most notable is her lackadaisical attitude, contributing to a carefree nonchalance in handling situations. 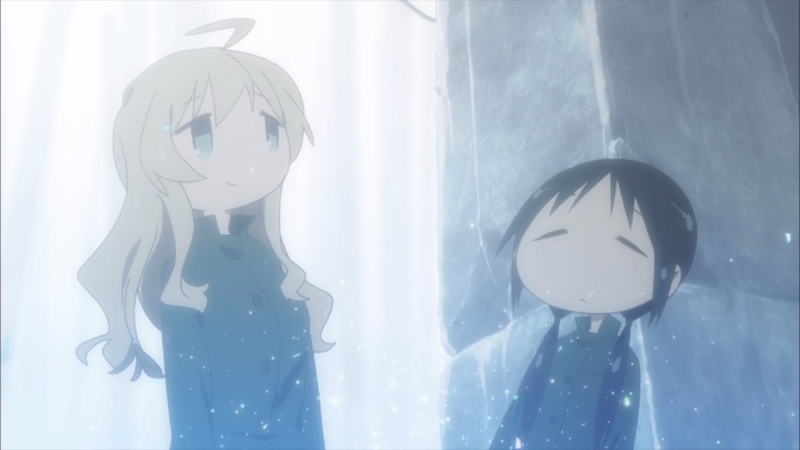 Thus, Chito and Yuuri look to each other for help during these trying times. Not just because they must, given they are practically the only people remaining on their godforsaken planet, but also because they can. They cover each other’s weaknesses: Yuuri keeps Chito calm whereas Chito keeps Yuuri reeled in. Yet their most important roles stem from the fact that humanity has an inherent need to think and to conjecture. This core represents the basis of nearly all thought: questioning and answering. For Shoujo Shuumatsu Ryokou, the main protagonists form a dichotomy insofar as the anime typically relegates them and their time to one of those sides. 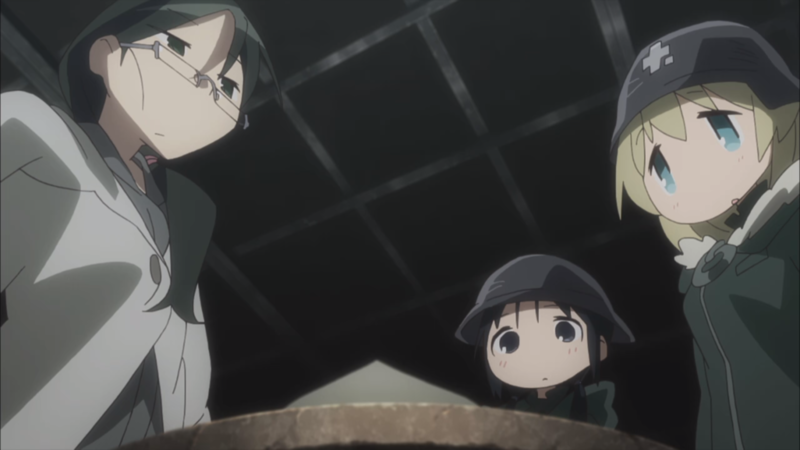 Yuuri is the questioner; Chito is the answerer. Yuuri is very simpleminded, but her frank honesty and unashamed questions invite a pure dive into everyday wonders that people generally take for granted. In turn, Chito attempts to explain these “foreign” topics, offering similarly simple answers which elucidate their overall complexity. Their inquisitive nature begets the semi-philosophical edge which the show leans into for much of the season. Yuuri will take Chito’s answers at face value, applying them in a straightforward manner for an out-of-the-box way of thinking. Chito will take Yuuri’s questions as a sign of her reserved maturity to view their predicaments in a new light. Together, the contemplative conversations they exchange, from the small asides to the larger sit-down discussions, further characterize themselves and hearken back to that crucial motif on the value and the nuance life contains. Looking more so at their relationship, it’s seemingly that of best friends, but a nugget of frustration and disparity exists on occasion. Calling it “animosity” or “hatred” is not correct, yet the anime unfortunately refrains from truly testing their bond to discover otherwise. Emotions remain mostly stable over the course of Shoujo Shuumatsu Ryokoueven as it scoots close to such interpersonal conflict. Ultimately though, and similarly to the story, the anime shies away from possible avenues, extreme or not. Yes, being friends is essentially an inevitability under such insane circumstances, but this missing challenge sticks out. Speaking of friends, a certain patchy spider from a particular video game borne of blood can be quoted as saying, “What is friendship, but a chance encounter?” Such an “uplifting” statement applies to the friends which Chito and Yuuri happen to meet along the way. Their brief stays combat the nihilism such a predicament would entail. A cartographer letting things go to start anew. A mechanic finding goodness in hardship and in failure. A zoologist learning about empathy, be it for man, fish, or robot. Arguably, the show doesn’t tie back in these scarce side characters all that well, but it may be unfair to expect them to do so, especially when their encounters have given them memories, direction, and hope anyway. No matter the case, Chito, Yuuri, and these friends prove that the human spirit lives on through sheer tenacity. It could be by thinking, or it could be by realizing the obvious. Either way, they’re all an existence within the anime that surely improves the project. For Shoujo Shuumatsu Ryokou, it’s imperative that the two leads Chito and Yuuri are as intriguing as possible since they are followed constantly and cannot have usual rapports with other side or supporting characters. Which is why Inori Minase as Chito and Yurika Kubo as Yuuri lead the charge with a couple of strong voice-acting performances. Chito has a resigned cadence to her words that bring out a so-done-with-this attitude, and a carefree lilt for Yuuri stamps in her usual jokey self. They each boast a calmness to their voices, too, lending even further credit to their VA chops when the role demands a delicate touch for this tough in-universe habitat. The original soundtrack follows suit with a diverse selection that does not interfere with the ladies or the grounded presentation but rather supplements the events with its purposeful music. Xylophones for the methodical sections; acoustic guitar strings and chords for those moments of reprieve; banging drums and quick drumlines for a can-do vibe. From the gentle pieces to the mild tunes to the depressing ensembles, the OST captures the mood and the beauty of the anime once again. But chief among its aural landscape are those items which may not be strictly categorized as part of the normal music offerings. I.e., Shoujo Shuumatsu Ryokou smartly takes advantage of its story and of its medium when it creates signature moments inspired solely by the sound in the air. A reddened sunset overlaid with a choir-like radio channel comes to mind, but the plinking of rain on various objects during a storm manifests as a trifecta of perfection. It’s very relatable, it morphs into an awesome song, and it follows the ideas and the intent of the show to the highest of degrees. It would not be a stretch to claim this chapter as one of the best parts in the whole anime. As for the opening track and the ending track, they too deserve praise. “Ugoku, Ugoku” aligns with its namesake as the steady beat and the reserved pacing move the song along. The techno, space-like sounds add a technological and mysterious edge that goes with the show, and the chiptune instrumentation instills a meta-regression that likewise befits the non-modern-day content. The “1, 2, 3…” lyric is also a catchy inclusion with its surrounding, fuller portion of the track that sandwiches comfortably within the docile beginning and finishing segments of the OP. “More One Night” targets a slightly different genre of music. This dance-party tune makes for a jovial conclusion to each episode, the quick repetition of the lyrics, the onomatopoeia, the piano, the bass, and the snapping making it almost mandatory to nod or to tap a foot to the song. It’s a non-complex, straightforward ED that caps off the rest of the audio design in groovy fashion. Before hearing it, I was already quite enjoying the anime. After hearing it, I had a feeling I was going to view it all very favorably when it finished – and my hunch thankfully turned out to be correct. That exchange and others had me engrossed during its run for two reasons: the laughs and the simplicity. Chito and Yuuri were often a couple of goofballs, their antics leading to a bunch of funny moments as they dealt with yet another obstacle and talked to each other on a regular basis. Yuuri and her hilarious lines. Chito and her deadpan stare. The two together getting by as best they can. They were a hoot and a gleeful pair. And it’s a simple show. Deceptively simple. This description is a positive mark in my eyes, for it takes this simplicity and delivers a show on being and living and wondering. Interlaced within this drive is a ton of heart behind its actions, and the necessity for hope, while slightly saccharine for this setup, is a message that I certainly endorse and appreciate no matter which walk of life somebody happens to tread. Shoujo Shuumatsu Ryokou flies to the top-tier level with enormous success. The thematic exploration in its story and the introspective angle in its characters are swell, and the production values for the entire anime uphold a beauty and a vigor that do not go unnoticed. Combined with an overall rewarding amount of entertainment, its prospects reach far above zilch.